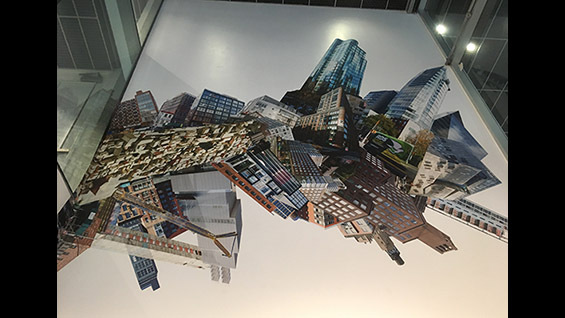 For the first time since 2009, members of the Cooper community can see an exhibition of work created by members of the staff of The Cooper Union, a group of highly talented men and women who variously work as designers, administrators and technicians in shops and studios. The Painting Office (led by Amanda Friedman) organized the show. She began planning last spring when she heard that the staff exhibition had once been a regular event. “I submitted a proposal to the Art Office last spring. We have a supportive enthusiastic team full of great artists in the Painting Office so I knew there would be enough hands to help,” she said. 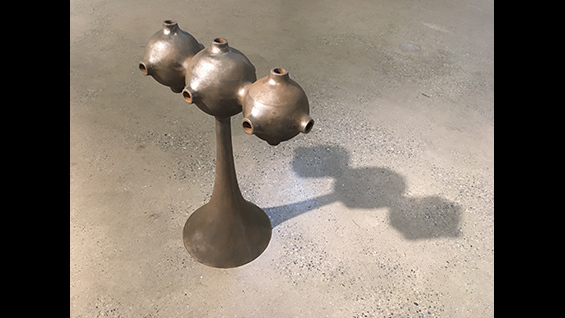 The show, which opened in the 41 Cooper Square Gallery on Tuesday, December 13, features work of approximately 40 artists. When Ms. Friedman contacted the staff, she offered an optional prompt that called for work that reflects on time. That led Frank Kurtzke, co-head technician of the Art and Architecture Shop, to bring in work from his Cooper senior show in 1983. Dale Perreault, library technician and playwright, is showing a painting he had given to his mother, a piece that had been inspired by her legacy. The time theme surfaces in pieces across the show including Corset 2, a drawing by Aisha Bell, general coordinator of the Saturday Program, that depicts a female figure, strapped into a tight bodice, whose head has split open chrysalis-like to reveal another figure inside. Upon entering the gallery, viewers see a piece by Richard Knox, a technician at Cooper for more than 20 years who passed away in 2013. The work shows a tiny, precisely rendered metal sculpture of farm buildings complete with weather vane over a frame filled with sand. 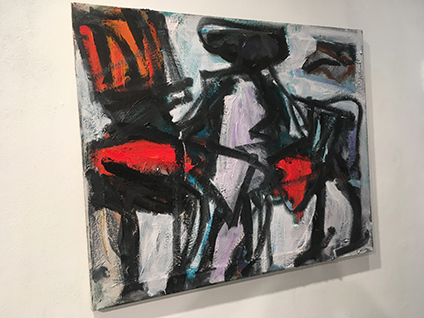 Like Mr. Rossi, Tessa Sutton, assistant to Acting Dean Mike Essl, makes work that also uses a subdued palette, but in Ms. Sutton’s case her color choices are not related to the subjects of her canvases so much as they are an experiment in limitations. Several years ago, she noticed that she rarely used pink or gray in her paintings, and decided that, for a while at least, she would paint only with those colors to discover what would happen. “I was thinking about limits in everyday life. Coming from the west coast a while ago I noticed there are so many restrictions in New York, not just financially but in terms of space and city infrastructure. My work was becoming too open and I wanted to reduce,” she says. The many technicians who work in The Cooper Union’s shops, studios and labs are also taking part. Marget Long, an academic support specialist in the IT department, contributed (Inferior) Mirage #9 (2014) to the exhibition. Part of Ms. Long’s ongoing investigation into the phenomenon of mirages, the photograph was taken at El Mirage Dry Lakebed in southern California. She’s drawn to mirages in part because they are images created by the refraction of light much the way a camera functions. Zach Poff, an adjunct professor and technical assistant for film/video, showed The Sound of the Sound of Music, a video remix that used an algorithm to jump from lowest to highest pitch moments in the famous movie musical’s score. This show is just one outlet for staff artistry. Nicole Thomas, who exhibited a shirt she designed and made through a combination of weaving and sewing, runs a weekly workshop for needle arts, including sewing, knitting and crocheting. 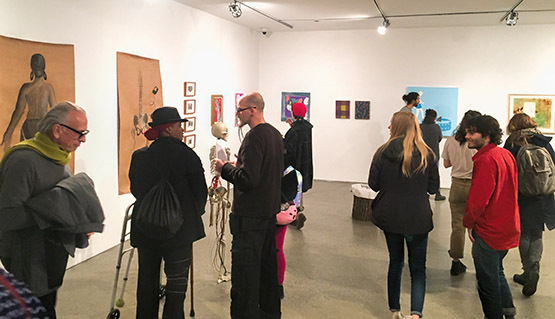 One regular workshop participant, Brenda Ferebee, coordinator of records and room reservations, also had work in the staff show entitled Up Close and Personal: Human Reduction/Droid Production (2016). The piece is comprised of three elements, a skeleton placed between two charcoal drawings. All three investigate the replacing of a body part—in this case the lower left leg—with robotics. 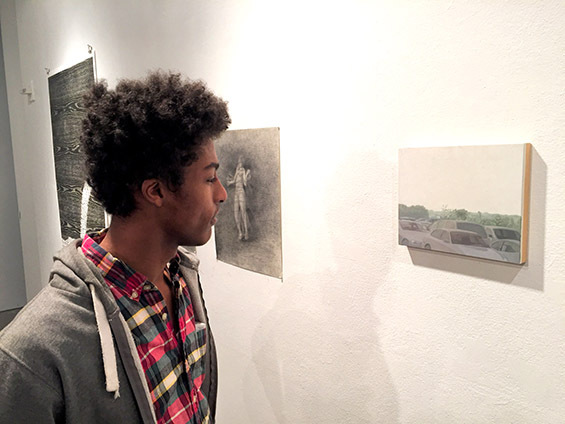 The show will be at the 41 Cooper Square Gallery through Saturday, December 17.